Virtually every hour of every day we benefit in some way from the numerous public structures and services provided by Montana’s state and local governments. These public structures - including schools, roads, parks, libraries, law enforcement, fire protection, courts, and regulatory systems – are integral to our quality of life in Montana. As individuals, each of us would find it virtually impossible to provide this infrastructure for ourselves. Rather, our collective investments- through taxes, fees, and other government revenue- help to sustain our well-being and ensure opportunity for all Montanans. Often our public structures are so integral to our individual and community health that we fail to recognize their importance until one of them fails- from something as small as the corner stoplight breaking to something as large as the failure of an adequate emergency response to the tragedy of Hurricane Katrina. Through the Montana budget, “we the people of Montana” identify, prioritize, and fund the public structures and services we all rely on for our safety, prosperity, and stability. The budget process is essential in our collective efforts to define our goals and plan for our future. Through the budget process, we must collectively answer the questions: What do we want for our future? What public systems do we need to meet those goals? What will these systems cost? How do we prioritize the allocation of public funds? How do we raise the money? 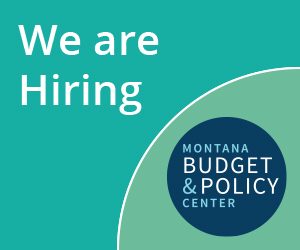 At the Montana Budget and Policy Center, we believe that a good budget is fiscally responsible. A good budget promotes future economic prosperity through investments that create opportunities for all Montanans, including our most vulnerable neighbors. A good budget sets aside money when times are good to provide protection to Montana families and communities when times are tough.